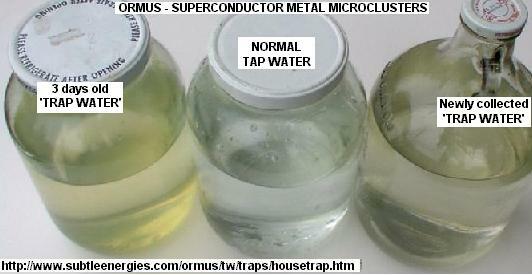 We believe that the m-state (ORMUS) materials dissolved in water are superconductors which respond to magnetic fields. We have observed that most water, when swirled in the presence of a magnetic field can be separated into two components; a magnetically responsive component and a non-responsive component. Magnetic traps of various designs have been devised to take advantage of this property in order to concentrate a form of the ORMUS elements. This concentrate tends to be “oilier” than ordinary water, it also tends to be lighter than ordinary water especially when it is moving in relation to magnetic fields. A more detailed look at this theory can be found in my article “Patterns of Motion “. There are a number of magnetic trap designs. These designs take advantage of the magnetically induced properties of the ORMUS elements in a variety of different ways. The Storage Trap was my first attempt at trap design. 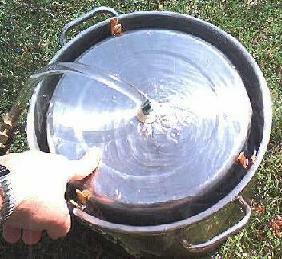 It is designed to repel the good water downward into the bottom of the trap. It is a good design and probably is capable of concentrating ORMUS more than any of the others but the down side is that it works on a batch basis. It is expensive but fairly easy to build and operate. The links of this Barry Carter page are resumed below, with reproduction of some of the pictures, enough I hope to understand the simple concept of ORMUS MAGNETIC CATCHING. This picture shows the basic principles of the magnetic trap used in this device. The water is moving through the hoses, and the m-state materials in the water are basically room temperature superconductors, so the magnet repels them. Because of pressure, the water wants to flow through point 2, but the m-state materials do not wish to pass through the magnetic field, so they move to the constant volume reservoir. These pictures show the trap when I first built it. The waste water is running down the drain, as it does now. The trap’s hoses have been considerably shortened now. The donut magnets I am using are from old microwaves and are very strong ceramic magnets. I have not written any parts lists or construction steps for this trap, as the pictures are pretty self-explanatory. 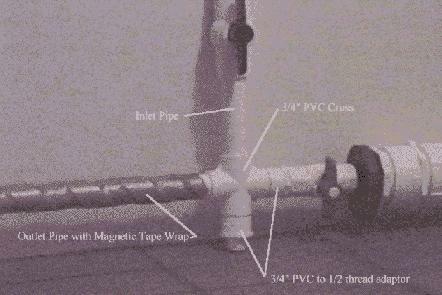 It is just made of vinyl hose, plastic fittings, hose clamps, and a 1L plastic pop bottle (1″ hose fits over the neck). 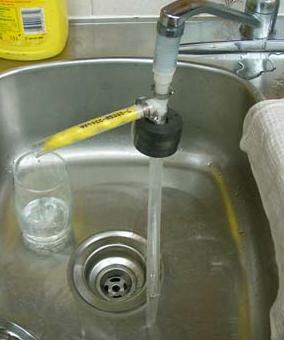 To use it just hook up the inlet to a tap and run water through it for about 15 minutes. I am using a ratio of about 100 : 1. This means I run at least 100 liters of water through the trap to get one liter of trap water to drink. My first trap water was made with well water, which is SO much better than city water. The city water comes from the river, and so most of the m-state materials have already left the water before it even gets here. I drank 700 ml of trap water that was made with well water. Almost right away, I started feeling a little shaky. It was like I had drank 4 cups of coffee. Things seemed a little different. After about 2 hours I started feeling very queasy. This lasted for probably a hour, and then my stomach felt a bit strange (hard to describe). It seemed like my sense of balance was a little off. I was in a great mood. I ate more than usual, I actually had 2 suppers. I woke up in the middle of the night, and my stomach was growling. I felt pain in my stomach because it was so hungry. It was a different feeling of hunger than I have ever experienced before. In the morning I felt pretty alert and hungry, but not as bad as in the night. I returned to the city Sunday afternoon (I am in university up here). I hooked up my trap, and made trap water. It is not nearly as good with city water. I had problems with using hot water in my vinyl hoses. The water just tastes like crap here. You can’t beat good well water. There isn’t as much m-state materials in the water here, and I have only been drinking a glass or two each day. I have been sleeping really good, and I feel more alert and focused during the day. This trap water is amazing stuff. I can’t wait to go home for the summer, then I can drink good clean trap water everyday. The following pictures so the trap in operation. 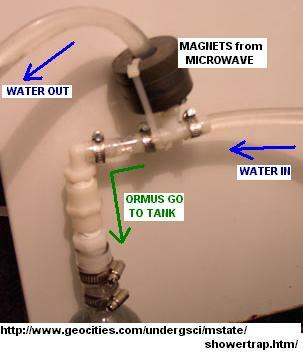 The magnets repel the m-state/ORMUS materials in the water, and they will go out the side. 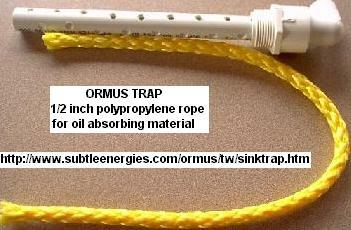 There is nylon rope in the trap output tube, as it attracts the oiler m-state water. I have a ball valve which allows me to throttle either the waste exit or trap exit. Turns out I didn’t need it on either end. The rope was packed good enough to keep the flow at a quick drip into the cup. This will depend on water back-pressure and how tight the rope is. The hose clamps aren’t necessary as there is no pressure inside the hoses. I was looking for the easiest project too.I ended up with a version of this one, connected to a garden hose.I found all the parts needed very easily and the only tools used were a sharp knife to cut the hose and a screwdriver to tighten the hose clamps.There are 8 cow magnets and I duct-taped the trap to a step-in fence post to hold it upright in the yard. This trap was intended to use while watering the yard with the well.I use a 1 liter water bottle for collection and it is attached with a hose that is stuffed with nylon rope.I make sure all the air is gone from the bottle and the hose with the rope in it. It seems to take between 2 and 4 hours to get some really good trap water.If we have used the well for several days it seems to deplete and take longer.If the well hasn’t been used for a few days it works more quickly. I wanted to use it while running the sprinkler.It turns out that the water going that fast doesn’t work as well.I get better results running the water very slowly.So, instead of using it as a sprinkler I use it as a soaker. One time I ran it overnight, before we started using the well to water the yard much, and it was amazing!The trap water in the collection bottle was extremely heavy looking and when swirled in the glass it didn’t want to spin at all.It also fell down the side of the glass instantly, unlike the regular water.It felt slippery in your mouth.This one time, it was strong enough that I actually diluted it to drink it. I tried runnig it overnight last week again and didn’t get the same results.It still had very noticable character changes and was good trap water but not as dramatic.It think might be because we are running the well so much right now.I wonder if it is that or the hot weather. . .
Sam wrote:About five years ago, I was irrigating a field with aluminum sprinkler pipe and well water. After irrigating the field for about two months, I noticed a clear, jelly-like substance forming at the end of the last sprinkler pipe. I didn’t know what the material was, but when I put my finger in it, it tasted sweet. This “drawing” represents two sections of pipe the upright lines in the center top of each section of pipe represents the sprinkler stand pipes which the sprinklers are attached to. The slash mark toward the end of the right pipe would represent the boundary between ordinary water and the m-state water. Since there is a dead space at the end of the right pipe section where water does not flow this would provide a comfy space for the ORMUS elements to collect. They seem to like aluminum in the first place and they like to remain stationary in relation to magnetic fields. This dead space at the end would fill both of those requirements. The alternative route for them to travel is out through a spinning sprinkler head. This arrangement fills all of the requirements of a magnetic trap. The inlet water is directed into the four upper slots on the outer tube by a one inch compression tee. This part might be a little difficult to find as it is not generally carried by consumer hardware stores. You are more likely to find it at a plumbing specialty shop. The rest of the trap illustrated in the pictures is just there to get the water to and from the trap portion. 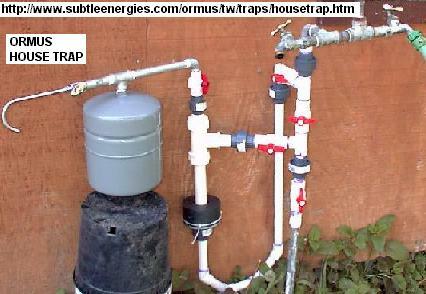 I made my trap with more valves and unions than necessary in order to have something that I could easily modify while it was connected to my home water system. 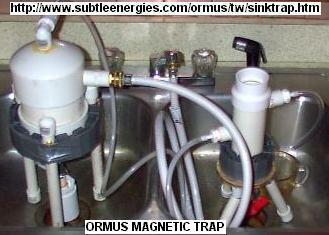 The metal tank in the picture is a small pressure tank which also provides a magnetically shielded space for the ORMUS water that has been captured by the trap. 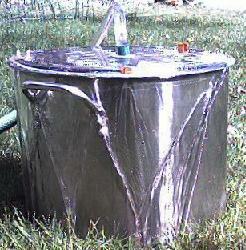 This pressure tank holds about a gallon of liquid and provides full pressure till it is empty. 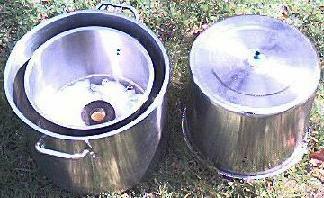 On the left is the old trap water which I collected three days ago. In the center is ordinary tap water. And on the right is the trap water which I just collected. Step 17.Install the oil absorbing material. This is made of a section of 1/2 inch polypropylene rope. Fiberglass reinforced plastic screen material can be used but it is not as safe since the glass fibers can break off and get into the output water. Fold the rope in two and push it into the end of the collector pipe. You must twist the rope as you push it in as it is a tight fit. Here is a picture of the entire setup as we use it at this time. 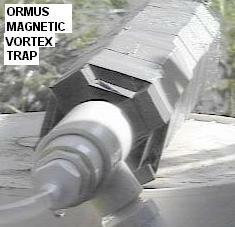 All magnetic traps rely somewhat on vortex effects but this particular trap uses a vortex a bit more actively. The vortex trap uses something called the “vortex tube phenomenon”. 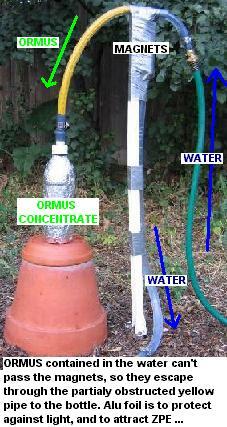 Vortex tubes can also be used to separate oil from water. When oil and water are spun together in a vortex tube the water, being heavier tends to follow the path of the hot air in the example cited above and the oil being lighter follows the cold air path and exits through the cold air exhaust port. The materials used to make a non-transparent PVC version of this trap cost less than $20.